Heavy gray clouds loomed overhead when we left our hotel in Bossier City this morning. Misty rain fell as we drove the final twenty Louisiana miles on US-80. By 8:30, we were in Texas, and the cow counting began in earnest. Within 20 minutes, I had accumulated 200 on my side (all of whom I lost shortly when we passed a cemetery, of course). The first city of any size that we reached was Marshall (pop. 23, 523). Home to two historically black education institutions—Wiley and Bishop Colleges—Marshall was a center of activity in the Civil Rights Movement, staging peaceful sit-ins even before the well-known event in Greensboro, NC, launched the sit-in movement in 1960. 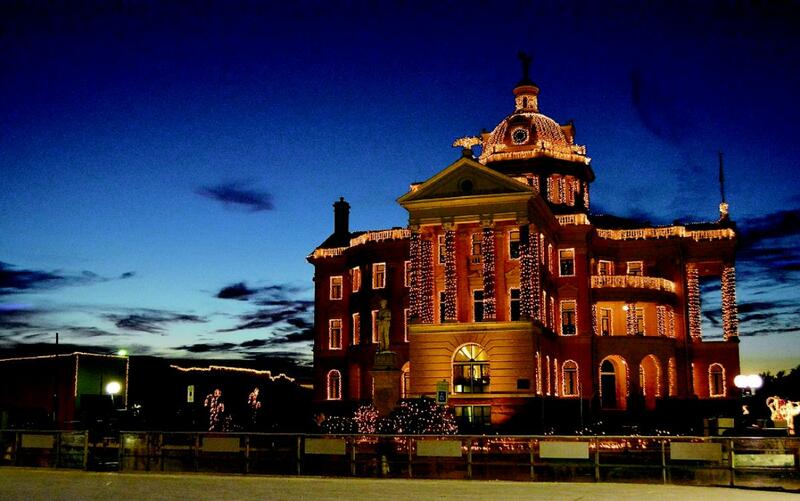 The city's biggest claim to fame today is its Wonderland of Lights, an annual festival that transforms this East Texas burg into a winter holiday utopia with millions of lights illuminating the buildings and landscape downtown. 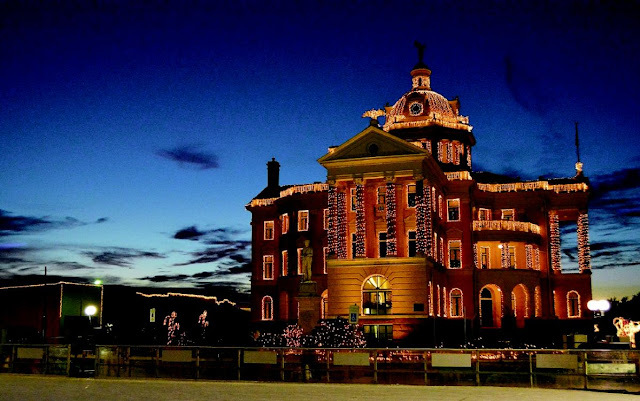 An ice skating rink springs up in front of the Harrison County Courthouse, along with a carousel and miniature train. Horse-drawn carriage rides are offered as well as an outdoor Christmas market and live entertainment. It seemed a waste to be driving through this time of year in the light of day. Our next stop was in Longview (pop. 80,455), home of the annual Texas Balloon Festival. The city is also the location of LeTourneau University, founded in 1946 by an inventor of earthmoving equipment. We visited the campus this morning to search for four letterboxes hidden there. As we were sitting inside our car stamping into the first box, what had been a sprinkling rain turned into a torrential downpour. Within ten minutes, the parking lot was transformed into a lake with several inches of water accumulating faster than storm drains could remove it. Wind buffeted our car and sent waves rippling across the parking lot sea. Relentless, the storm pounded the area for another 20 minutes. WE KNEW THE FORECAST CALLED FOR STRONG STORMS; WE JUST DIDN'T KNOW WHAT THAT MEANT. When the deluge finally abated, we ventured to leave. With the hiding spot for the letterbox we were holding now underwater from storm runoff, we left it safely under a light pole escutcheon nearby and emailed the owner the location of its temporary refuge. Early on during the storm, we shifted the car's position away from a couple of trees adjacent to the parking lot when we realized how strong the winds were becoming. Leaving campus we saw a pine nearby that had snapped and crashed during the storm. Such was the strength of the rain and wind that we didn't even hear the crash a hundred yards from our location. VARIOUS SCHOOL DISTRICTS IN THE AREA BOOK THEIR CLASSES FOR FIELD TRIPS HERE. On our way out of town, we stopped for another letterbox in the public library and saw the town's Safety City across the street. 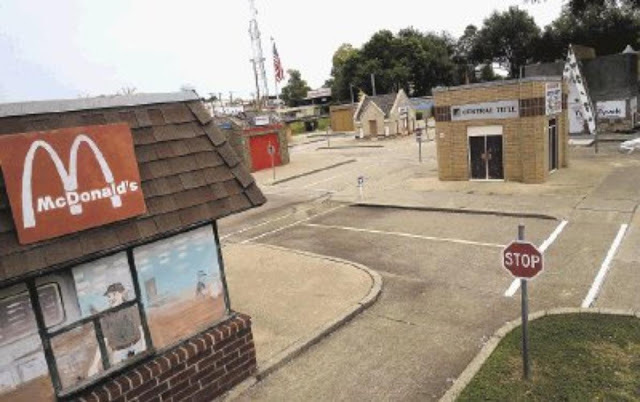 The miniature city was built in 1991 as an instructional tool to teach school children the rules of bicycle, pedestrian and auto safety. With 16 small buildings and child-scale streets, the village is equipped with working traffic signals and a railroad crossing. Lessons are targeted at two age groups. Fourth graders drive miniature cars powered by lawnmower engines, while kindergarten students ride the streets on bicycles or big wheels. Safety City appears to be an example of hands-on learning that's engaging and just plain fun. We found some adult-size fun further west in the town of Grand Saline (pop. 3,136). Though it's pronounced suh-LEEN, the town's name does reference the 250 million year old massive lode of natural salt left by an ancient sea. Estimated at 16,000 feet deep, the deposit is mined by Morton Salt, the town's largest employer. 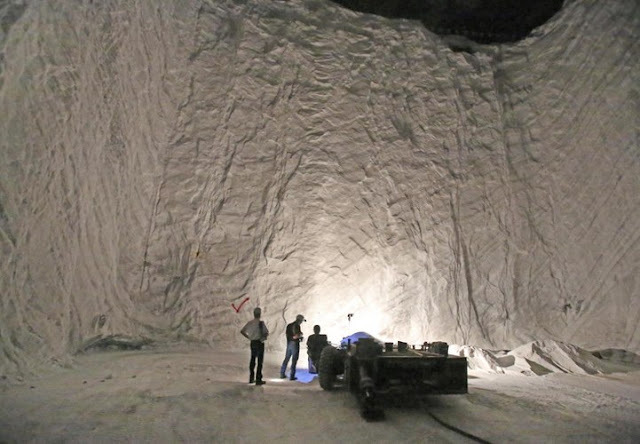 It's one of three rock salt mines the company operates in the U.S. Though safety regulations shut down mine tours in 1960,we were able to visit the town's Salt Palace situated on US-80 in downtown. It's a small one-story building housing a museum and gift shop with two exterior walls made of local salt blocks. 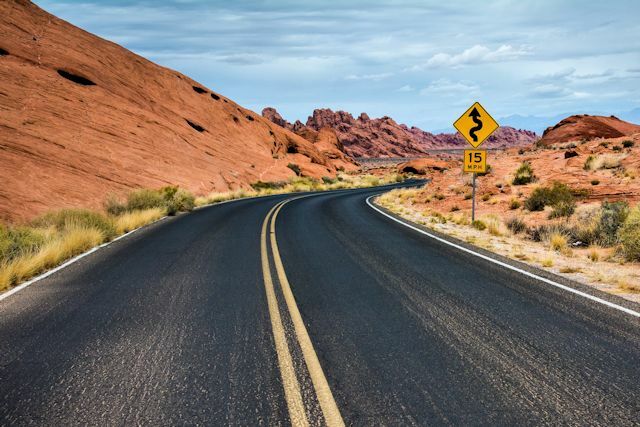 Dust and highway grime have given the white salt the color and appearance of granite. Every visitor is given a souvenir crystal of rock salt as well as a warm welcome from the knowledgeable docent of the day. And yet some visitors will actually lick the building to make sure it's made of salt. 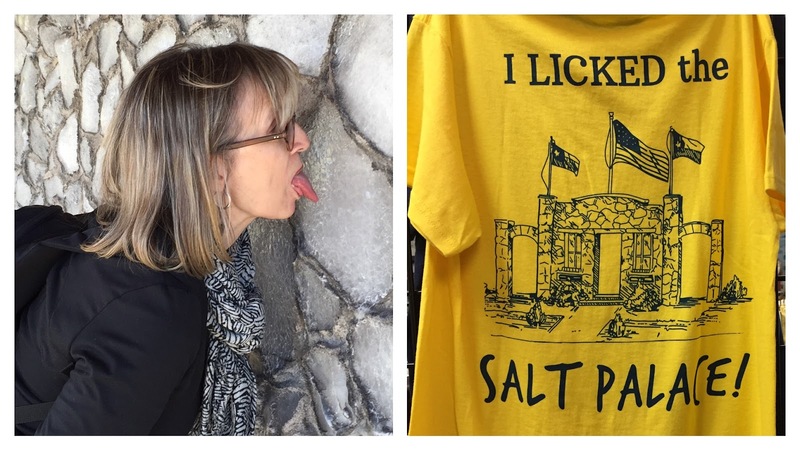 Ten miles west of the salt palace, we stopped in Edgewood (pop. 1,439) to check out their Heritage Park outdoor museum and look for a letterbox hidden there. Founded in 1976, the park continues to evolve and now covers parts of three city blocks. 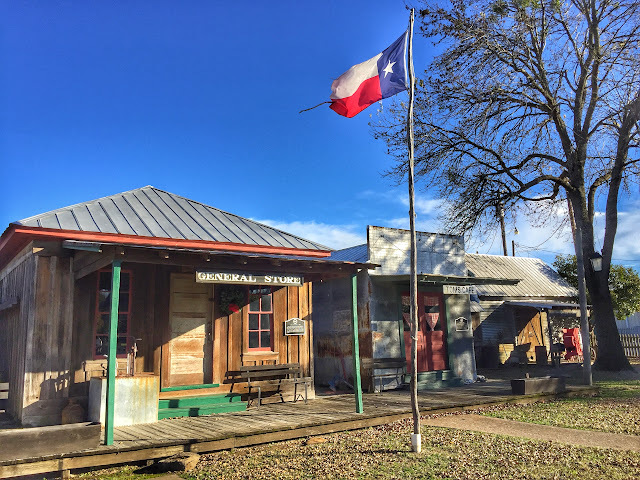 The local historical society operates the park, which preserves 20 authentically restored and furnished structures depicting rural life in East Texas around 1900. Supplementing the originals are replicas of period buildings. BONNIE & CLYDE ONCE ATE AT TOM'S CAFE(R), IN ITS ORIGINAL LOCATION. A picket fence surrounds the park, which we learned is open only Thursday, Friday and Saturday mornings. As we wandered around looking at the buildings from the outside—trying to figure out if we could gain entrance to obtain the letterbox—volunteer handyman Johnny was assessing recent storm damage on the park's vintage church building. He kindly unlocked a gate and allowed us to wander around to take photos, which we did. Fortunately, the letterbox was tucked out of sight between two buildings, and we were able to find it and log in unobserved. 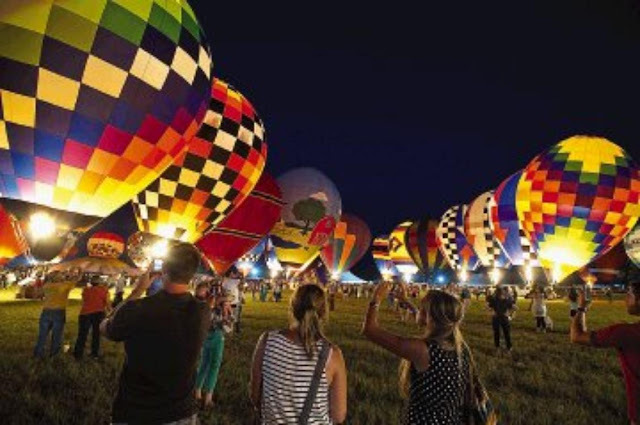 By the time we left Edgewood, the clock was pushing 4 p.m. and we wanted to reach our hotel in downtown Dallas before darkness fell, so we decided to skip the letterboxes on our list ahead and drive the remaining 60 miles without stopping. Eight miles before we arrived, just after we passed Dallas's I-635 perimeter highway, US-80 officially ended as it merged with I-30 going into the city. WE'RE IN THE CITY NOW. Over the years, the remainder of old-timer US-80 going west was first dual marked with interstate highways that took over its route and later retired completely west of Dallas. As we continue toward San Diego, we'll definitely try to spend time on local highways but they won't be our old friend US-80. Tomorrow we plan to spend the day seeing some of the sights in Dallas, a city we've never visited, though we've been through it and around it numerous times. THE SALT PALACE WALLS HAVE BEEN RE-BUILT SEVERAL TIMES; THESE DATE FROM 1993.